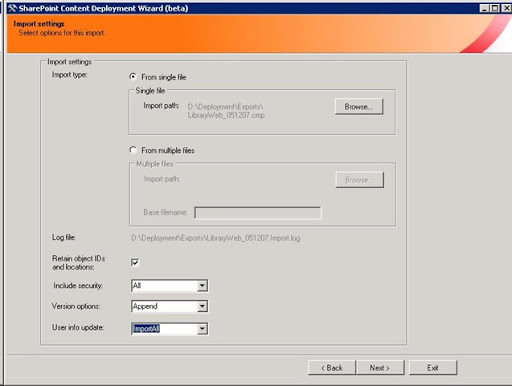 Currently we are migrating HTML and Notes Database data to SharePoint due project timeline, We plan to migrate content first in to staging environment and use SharePoint Content Deployment Wizard to export site's and Import in to Production environment. 2. 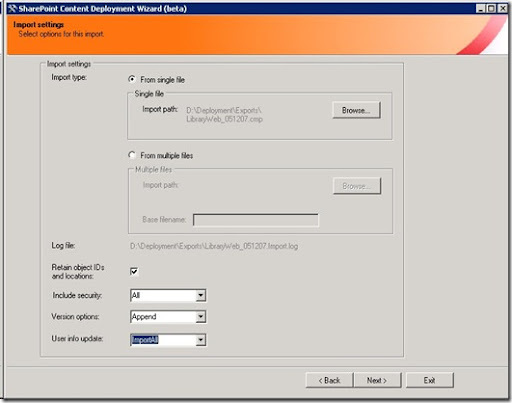 From single file'/'From multiple files' options - the Wizard always exports with file compression enabled, so when exporting content over 25MB, files are split into several files at this threshold. 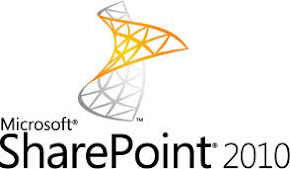 Next MOSS version going to call "Microsoft SharePoint Server 2010" Instead of "Microsoft Office SharePoint Server 2010". When I try to access the Shared Services Provider Search Settings the system display "The gatherer is Shutting down" and Exception from HRESULT: 0x80040D2 error. To resolve above error, Go to Start > Administrative Tools > Services and look at the “Office SharePoint Server Search” service and click start. 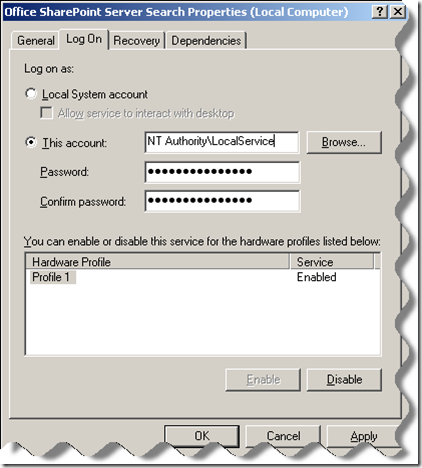 I change setting to Log on as Local System account and select Allow service to interact with desktop. 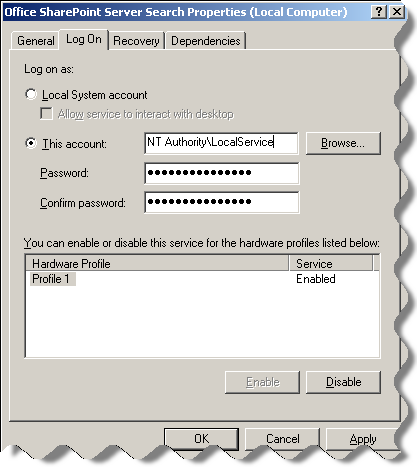 I go back to Shared Services Provider, Search Settings the system display search configuration page. Starting on April 1, 2009, we are making SharePoint Designer 2007 available as a free download. Be sure to watch the video in the "Related Resources" below to learn more about details and future direction. Join Hilton Giesenow as he demonstrates how to install the components of Microsoft Office SharePoint Server (MOSS). 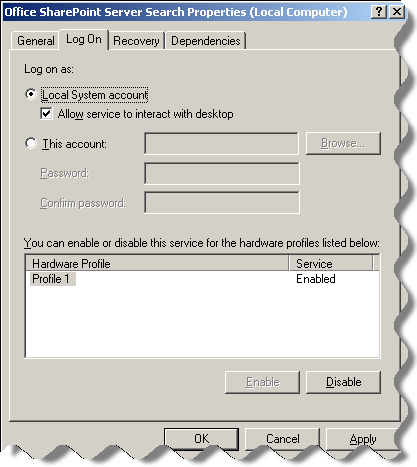 The video covers installation onto a SQL Server environment and using Active Directory for authentication. In this first part, we look at installing and configuring the MOSS instance and in the second part we will look at finishing the installation and configuring the farm. Join Hilton Giesenow as he demonstrates how to install the components of Microsoft Office SharePoint Server (MOSS). 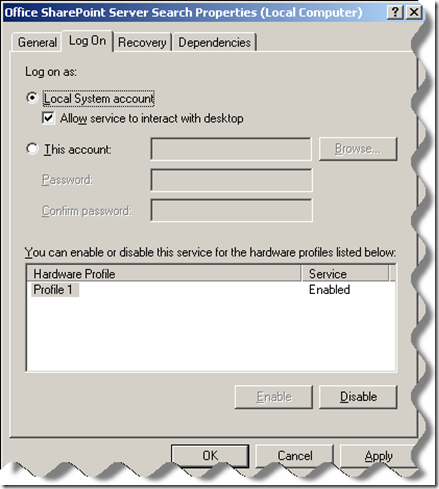 This 2nd half of the series covers configuring the shared services on the server and creating and configuring a new Shared Services Provider as well as creating the first site collection in the new instance. 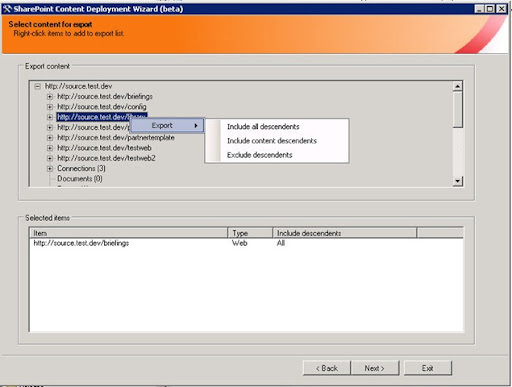 How Do I: Configure Search Indexing? In this video, Hilton Giesenow demonstrates how to configure search indexing settings in your Shared Services Provider to index the content of your MOSS web application. The video looks at using the Search site template and also at indexing external content, specifically a network file share.